The original BioLite CampStove features a cellular front grill to distribute side heat evenly, and an open top to allow full-on cooking heat to rise freely. That same heat is used to charge an electricity cell on the side of the stove. These BioLite stoves weigh just under a kilo when empty, and measures roughly 12cm x 12cm x 21cm, so it’s small enough to pack into a large rucksack, or in the boot of the car if you’re just going on a regular camping trip. At under a kilo, it punches way above its weight in terms of functionality, too. The stove itself is made from high quality stainless steel, so it won’t rust or tarnish. 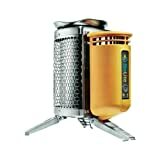 The BioLite CampStove is a really handsome stove, and the orange cell on the side makes it easy to find among all your stuff. The original BioLite CampStove stoves are a combination of stove and charger. They say that you’ll need about 20 minutes of burning for roughly 60 minutes of charging, which we think is pretty decent. The charger cell is a USB one, so you can charge most phones and tablets, or plug in USB lights. The grill is a cellular style grill, which distributes heat evenly around the stove, and there’s space on top for a pan or a kettle. These BioLite stoves runs on biomass fuel, so basically anything that’ll burn. Their intention is to create smoke-free fire, so quality, untreated wood is best. At under a kilo, it punches way above its weight in terms of functionality, too.